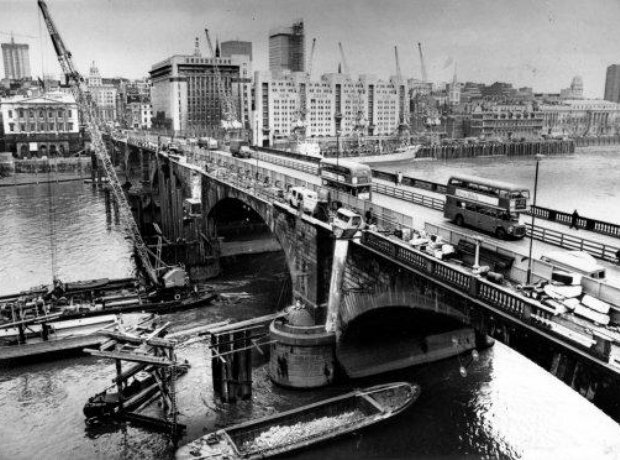 Workers dismantle London Bridge after it was bought by an American businessman. It will be transferred stone by stone and rebuilt in Arizona. Manchester United became the first English club to win football's European Cup. Skipper Bobby Charlton greets his opposite number from Portugese team Benfica before kick-off. Elvis performing at his '68 Comeback Special. Coretta King, widow of civil rights leader Martin Luther King Jr. arrives for a memorial service in Miami Beach, Florida. King was assassinated on April 4th 1968. George Harrison plays the sitar in Bombay in 1968, where he visited to record his music.